When it comes to AI, smart designs, and new interfaces, UX professionals are in a unique position to advocate for inclusive design principals and incisive methodologies for understating not just what the IoT is, but what it does and can do for communities the world over. This talk revisits the question of, to recall the work of fellow digital anthropologist Genevieve Bell, the “mess and mythology” embedded in smart technologies, and asks how we can harness the power of humanity’s global imagination to offer not only access to, but authorship of, the internet of things to everybody. Since 2005, digital anthropologist and New Relic product researcher Ali Colleen Neff, Ph.D. has been studying the ways people all over the world use, make, and circulate digital things. 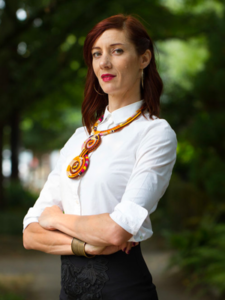 In her work as a professor of digital cultures at Portland State University and as a consultant for a spectrum of digital projects, she has helped replatform the National Parks website and create new digital environmental justice tools for Oregon Metro. She is interested in the ways makers and users draw from their cultural experience to spark new possibilities in the world of tech. In addition to directing the Digital Africa project, cultivating groundbreaking work on Digital Subcultures, and researching hip-hop digitalities, she has authored books, published a host of academic articles, and given keynotes on gender race, and media. Her work hasbeen the recipient of major awards from the Mellon Foundation,REACH, FLAS, and DK Wilgus. There is a video of this event. You must be a member and signed in to see CHIFOO videos.